The good people at Data Robotics are now bring DroboApps to the masses. 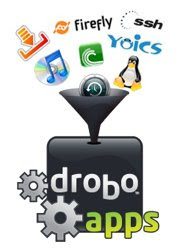 Theses applications get your Drobo to do even more than you thought possible. You can turn your Drobo into an iTunes server, a BitTorrent sever, and a FTP server just to name a few. The only downer is that it requires a Drobo NAS adapter which carries a $199 price tag. For more info and the available apps, click here.